Q: What do you get when you cross one community support officer with one LGBT+ officer and a chance meeting in the Union bar? A: One of Lampeter’s best attended events, Speak Out. 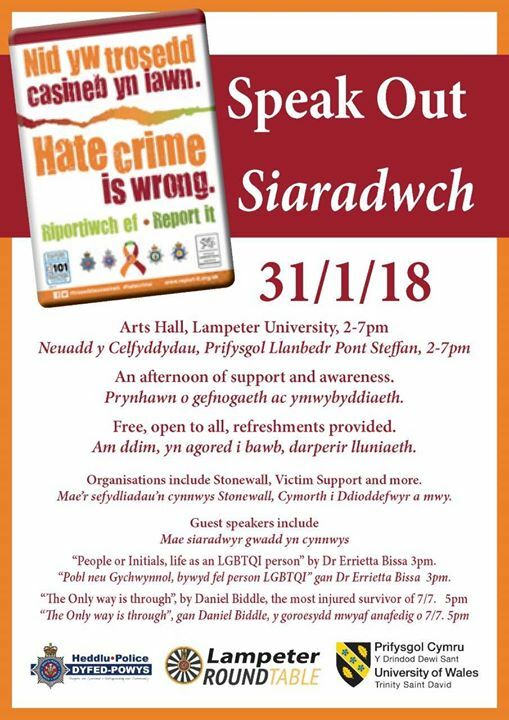 PCSO Ryan Jones and I got talking about the rise of homophobia, transphobia, and damaging far-right wing ideals on campus and in town. We decided that something had to be done to bridge the gap between locals, students, and the services, and to raise awareness of the kind of discrimination and struggles that some minorities face. 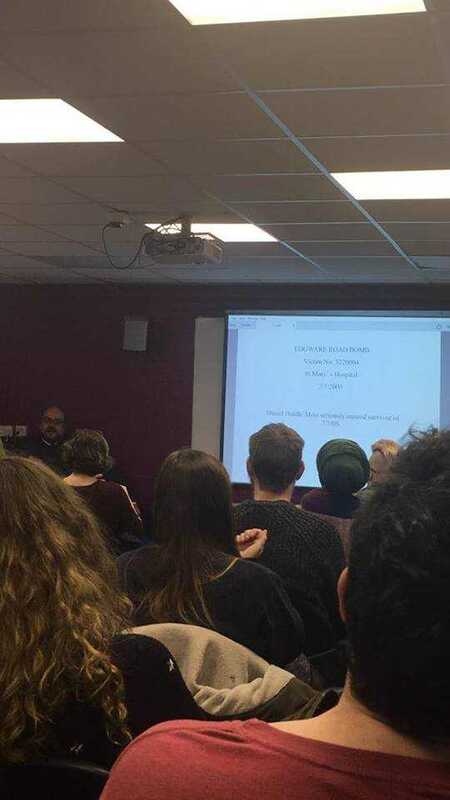 The aim of the event was to challenge people’s pre-existing perceptions, to show support and solidarity with any and all minorities, and to break down the barriers that seem to exist between witnessing or experiencing a hate crime or hate incident, and reporting it. 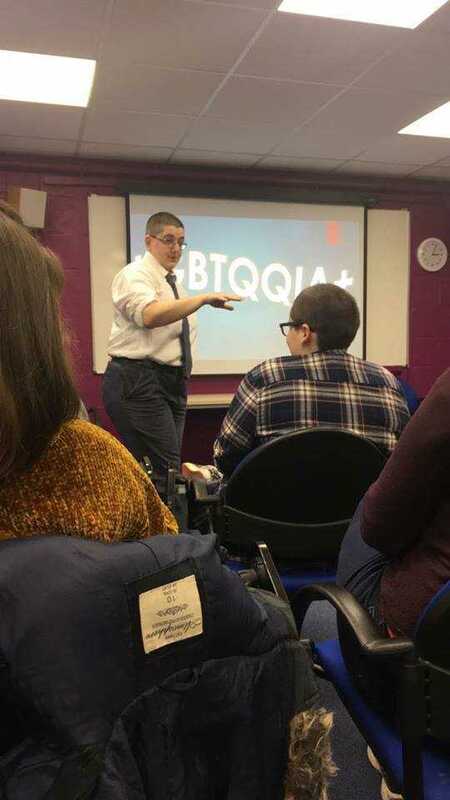 We were lucky enough to get two excellent speakers on board: Dr. Errietta Bissa talked about life as an LGBT+ person, and the way that the community is constantly shifting. She spoke from personal experience, and provided explanation and discussion of problems that LGBT+ people can face from both inside the community and outside. Her audience was mostly comprised of people who do not identify as LGBT+, and everybody left feeling as though they had learnt something. The second speaker was Daniel Biddle, the most injured survivor of London’s 7/7 attacks. Dan talked us through the day of the attack, showed pictures of his injuries, and discussed the lasting effects the incident has had on him. He challenged the audience’s views of disabled people, both with visible disabilities and not, and touched on the kinds of issues and hate incidents he has experienced since being in a wheelchair. We were extremely pleased with the number of people who came, both students and locals, and I would like to particularly thank the rugby team for coming and staying with an open mind to challenge and break down perceptions and stereotypes that exist very prominently in sports. For Errietta’s talk, the room we had booked was almost full, and for Dan’s later that evening we filled all the chairs, and people were sitting on the floor so they could listen. The event was more successful than Ryan and I even dared to hope, our goal of expanding even one person’s understanding of social issues was met and then smashed completely out of the park. I’d like to thank Ryan for organising it with me, the Union for accommodating us and fully supporting the event even in its early days, every single person who stayed for tea and coffee and biscuits, the Round Table for sponsoring the day, and the biggest thanks to Errietta and Daniel; without whom there would have been no event to talk about.